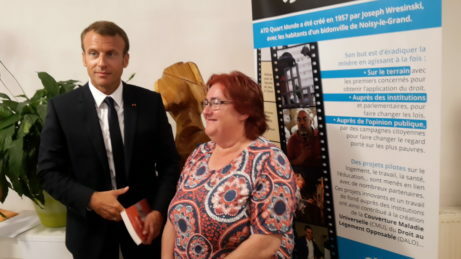 At the beginning of President Emmanuel Macron’s term of office, ATD Fourth World had made their traditional request for an interview with the new head of state. 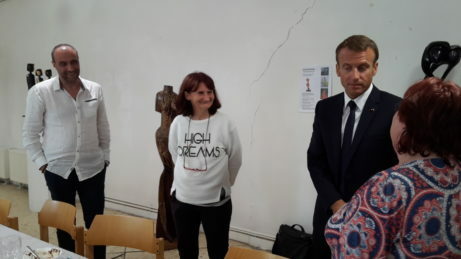 As a result, three days before the announcement of a new Anti-Poverty Strategy, President Macron came to the ATD Fourth World offices in Noisy-le-Grand (France) for a working lunch with ATD Fourth World activists. 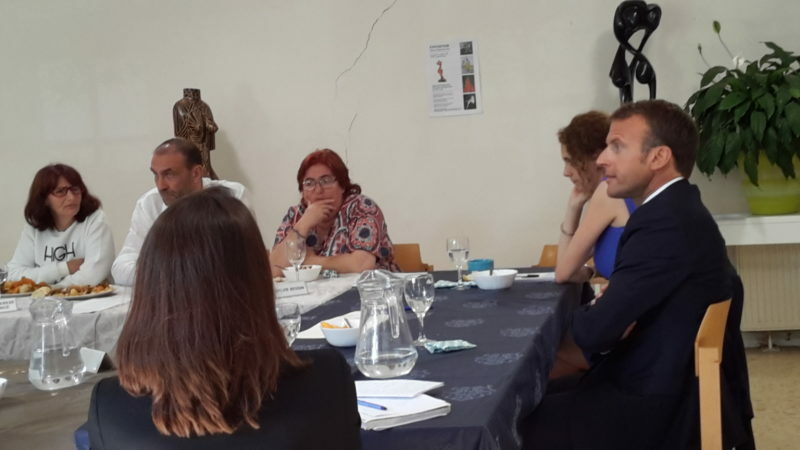 Those taking part included people living in poverty, families staying at the Family Development Centre, and workers from ATD’s ‘Work and Learn Together’ project. Participants came to the meeting well prepared and with eyes wide open, determined to make their voices heard and push for change. 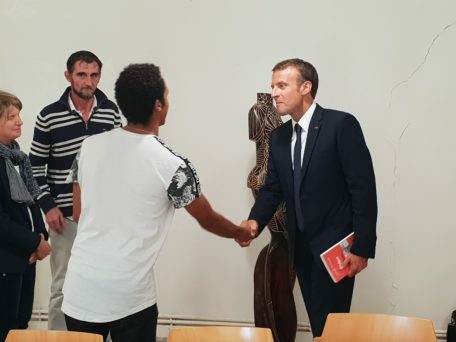 Here, some of the activists recall the points they made to President Macron during his five-hour visit on September 10th 2018. “We were able to say what we needed to say, whatever we wanted the president to hear. He was very attentive. He took his time with each person. I couldn’t believe it! It was a really important encounter. He asked me questions about my life history, and gradually I began to feel at ease. Maybe what helped me was having taken part in the People’s University, where we speak openly on a topic. “It was stressful. The president asked questions about what I wanted to do. I told him I’d previously been sent on a work placement in horticulture but that it hadn’t been my choice. He asked me what my choice would be. I replied ‘Sales’. He asked me why. I explained that I’d already had some work experience at a Leisure and Crafts store. Some of the clients were painters, others were there for their children; and I really liked it. I told him that I was at Noisy-le-Grand on the Volunteer Service scheme, and that it was preparing me well. What do I expect from this encounter? I hope there will be more jobs, so that people will be able to choose their future career. Maybe things will change. I don’t really know, because I’m not at all interested in politics. 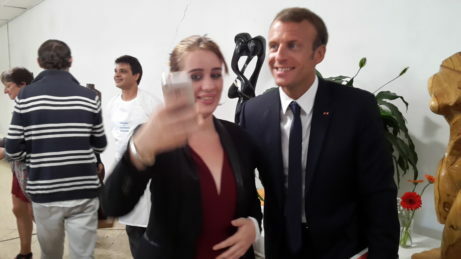 But I do know it was important to participate and to speak to the President about school and training in the hope that I, and others like me, can pursue the career of our choice. “It’s not every day you meet the president. Afterwards I wasn’t sure it was going to change anything, because his Anti-Poverty Strategy had already been decided. But the president took the time to meet us, and respected people who expressed themselves. So maybe there will be progress in the way he views things. I have high hopes. He wasn’t at all snobbish with us; he could have listened and then left. He didn’t eat while we were talking. I also appreciated the way he greeted people when he arrived and said goodbye when he left, with a personal word for everyone. He took notes. It was an interesting discussion, and you could reply however you wanted to. He asked me questions. I have six children. Two of them work, and the others are on Unemployment Benefit like me. I answered him without forgetting that I’m an activist and that I was representing all the others. The most important point I raised was about increasing Unemployment Benefit. He asked how much I hoped to receive. In fact, the goal for us is not to be dependent and not to have to rely on charitable organizations. If we had a bit more income, we could devote more time to searching for work. We wouldn’t have to rack our brains all day long figuring out how to pay the bills. He mentioned that some people prefer to remain on benefits. But in my opinion it’s always much more valuable to work and earn your own money. Maybe some people are happy to go to Catholic Aid or Public Assistance. Not me. Another thing he said was that people on Disability Benefit don’t have a choice; but those on Unemployment Benefit do have a choice. I’m sorry, but most people have no choice other than to be on Unemployment Benefit. It was important to meet with the president. Otherwise he wouldn’t hear the voice of those living in the most extreme poverty. No president has known extreme poverty – unless through friends at school or something like that. He actually came in person, without a minister. All the same, I regret that it happened so late, only three days before the launch of the Anti-Poverty Strategy. I found him to be interested, even moved at times – though I know our politicians often put on an act. He took notes and asked a lot of questions. 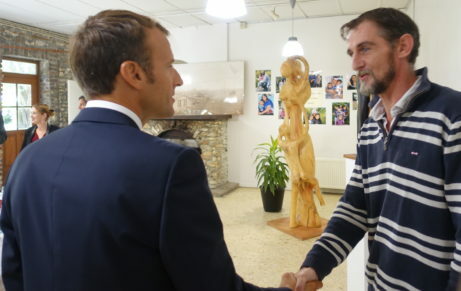 I explained to him that I receive long-term Unemployment Benefit, which is under 500 euros a month; and that even though I have a disability, I’ve never signed the papers to claim Disability Benefit. He asked me why. I replied ‘Because I want to work’. I took the opportunity to tell him that none of us choose to be on Unemployment Benefit. I spoke for myself and on behalf of the other ATD Fourth World activists. I don’t think I expect much. Just that the president recognises that this is about human beings. In which case there are imperatives. Politics has to become more humane. People must be treated like people, not like numbers or like ‘the poor’. I didn’t expect to be listened to like this. We base our ideas on what the media tells us. I thought the president would be more stand-offish. He had a watch and a phone. Not once did he check the time and say ‘I have to go’. We talked about placing children in care. I am the mother of three children and my two older girls are in care. We also talked about school, training, financial issues. I think what interested him most was school and training. What results do I hope for? That he passes education reforms, so that they stop just putting people like us wherever there are openings and making decisions for us: there needs to be less emphasis on college courses for students who are experiencing big problems in their lives. I also want Unemployment Benefit to be reformed, so it increases a little. You could see that the president was moved to hear that we can’t make ends meet on Unemployment Benefit. The honest answer to the question about the results of this meeting is that I want to wait until the end of his term to see what happens.